Premium presentation and build quality make the 13.3-inch HP Spectre x360 (13-4009TU) immediately eye-catching. Its all-silver styling, polished bits, and raised ‘Hewlett Packard’ lettering on the lid, all make it look like a product that’s costly. Depending on what’s installed in its belly, it definitely will be expensive. The model we’re looking at here has a top-end configuration for a top-end price, and is aimed at those of you who want the swiftest performance from your tablet-convertible product. Our unit came fitted with an Intel Core i7-5500U CPU, 8GB of RAM, and a 512GB solid state drive with an mSATA interface. It’s a configuration that can put plenty of laptops to shame as far as capacity is concerned, but you do have to pay $2399 for the privilege. What you’re also paying for is a screen resolution that’s as high as 2560x1440 (text in Windows 8.1 is enlarged by default to make it readable), and of the IPS (in-plane switching) variety. It’s bright, rich with detail, and it sits behind Gorilla Glass that gives it a reflective finish. Since the processor is of the fifth-generation Core i7 series from Intel, there is a need for vents and a fan (unlike products that use the company’s lower-powered Core M CPUs). The fan whirs and can be heard when the CPU is doing work (such as when processing video streams); we didn’t find it to be an annoying or intrusive sound in a room with a regular noise floor. Warmth on the underside of the laptop was also tame, though we’d advise against using the device on your lap when the CPU is doing lots of work. Covering the air vents underneath could cause the warmth to be accelerated. Performance from the laptop met our expectations, with Blender 3D finishing our rendering task in 40sec, and 3DMark recording 3765 in Cloud Gate and 563 in Fire Strike. The graphics processing in the Spectre x360 is handled by the Core i7 CPU (Intel HD 5500 graphics), so it’s not useful for gaming, but it will play many games of a simple nature, as well as various titles downloaded from the Windows Store. Storage performance from the 512GB SSD was quick. In CrystalDiskMark, it recoded a sequential read rate of 515.4 megabytes per second (MBps), and a write rate of 438.2MBps. The write speed, in particular, is faster than what we’ve seen from other premium laptops that use mSATA-based storage, such as Dell’s XPS 13 (266.5MBps), but slower than laptops that feature PCIe-based storage, such as HP’s Omen gaming laptop (732,7MBps). For transferring files wirelessly, you get an 802.11ac adapter (Intel Dual Band Wireless-AC 7265), and this gave impressively fast transfer rates when used with a TP-Link Archer C9 router. When copying movie files of 1-2GB across the wireless network from a distance of up 3m away, the speed peaked at 54MBps, and averaged 47MBps. You also get Bluetooth, so that you can hook up wireless peripherals and speakers. That said, the speakers on this laptop are of a decent quality, but their location underneath the base makes them easy to muffle when using the device in your lap. As for battery life, we got over six hours out of it during our evaluation. In our standard test, in which we disable power management, enable Wi-Fi, maximise screen brightness, and loop a Full HD MP4 video file, the Spectre x360 lasted 6hr 17min. Holding the 13.3in screen is a pair of highly polished hinges, and they are the standout feature of this device. They are thick hinges with dual mounting points for the base and the screen. They function in the same vein as laptops such as Lenovo’s ThinkPad Yoga, in that they can allow the screen to tilt back around the back of the device so that it can be used not only as a notebook, but also as a tablet, and as a display device in ‘stand’ and ‘tent’ modes (with the keyboard sitting out of the way). Physically, the hinges feel strong, and the conversion from notebook to tablet can occur easily as long as you don’t mind having to lift and manhandle 13.3 inches and 1.4kg worth of notebook to do so. The keyboard remains exposed when you turn the device from notebook to tablet. 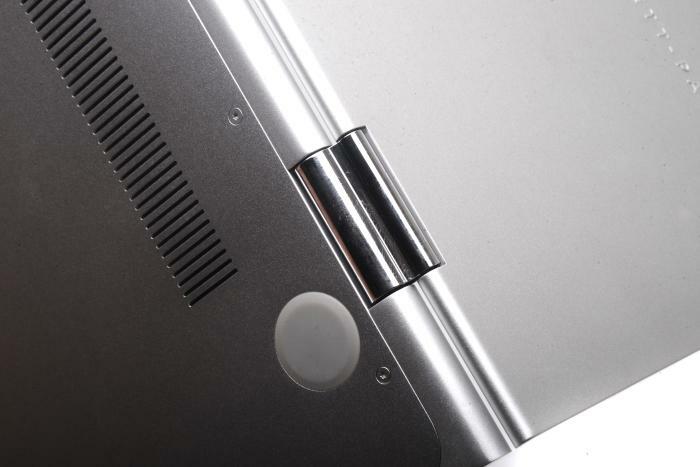 Unlike products such as the ThinkPad Yoga, which has keys that drop down into the base so that they can’t be felt in tablet mode, the Spectre x360’s keys will still be of a regular height so that you can press them, but they will be disabled so as to not leave inadvertent marks. One of the two hinges that make tablet mode possible. The same courtesy wasn’t extended to the extra-wide touchpad during our tests. 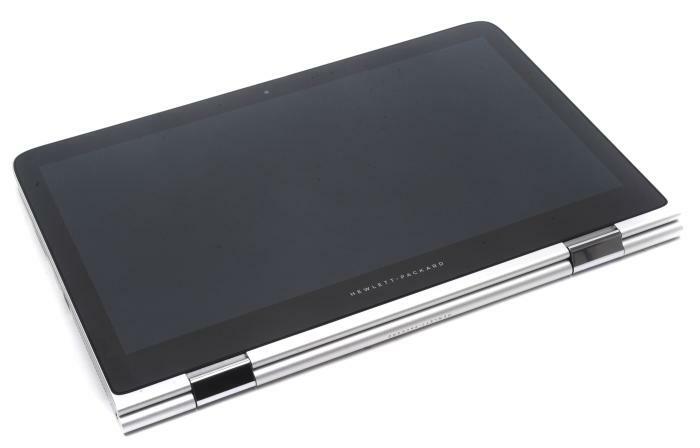 HP has installed a touchpad that is 140mm wide and 66mm deep. We couldn’t find any extra functions to play with in the touchpad software that HP installed; it’s basically just a regular touchpad that supports gestures such as two-finger scrolling, three-finger flicks, two-finger taps, pinching and rotating, but, in our experience, nothing else specific for the extra width. Now back to our original point: the touchpad still remained active when the device was in tablet mode. Holding the tablet with both hands ended up with our fingers moving the pointer, and presses of the touchpad closed windows or opened applications depending on where the pointer happened to be located at the time. It’s a fault that can perhaps be fixed in an upcoming driver update, but it diminished the overall experience for us. We also couldn’t find a way to disable the touchpad manually, which we would have gladly done prior to entering tablet mode. The lack of a key combination to disable the touchpad was also highlighted as we typed. Since the touchpad is much wider than most other touchpads on similar devices, it can get in the way of your right hand a lot easier as you type. Primarily, we ended up pressing down on the pad inadvertently, causing a scroll lock action to occur, which moved pages up and down with slight movements of the hand. It can be nice to have a laptop such as this that's able to transform into something un-laptop-like, but the reality, for us, at least, is that we seldom used anything more than notebook form and, from time to time, stand or tent modes. These two modes came in handy when all we wanted to do was watch video streams, or to flick through photos. Rarely did we feel the need to go into tablet mode, particularly due to the 13.3in size and 1.4kg weight of the device, but when we did, it was mostly to lay it flat on a desk and draw or write on it. If you’ve ever wanted the ability to turn your regular laptop into a slate-style device for drawing or handwriting recognition, then it’s the type of product that’s worth considering. This is mainly due to the fact that it will give you great performance for such tasks, and because its screen has plenty of real estate and a high resolution. You’ll need to supply your own pen accessory. Drawing and handwriting on the screen can be undertaken with little to no delay for the pen strokes, though the accuracy of lines marked on the screen will depend on the thickness of the pen that you use. We used a Belkin, rubber-tipped pen, which isn’t ideal for drawing, but it was fine for writing. The keyboard has full-sized keys except for the arrows and ‘action’ keys, and they are soft and comfortable to hit for long periods of time. They supply a decent amount of travel, and you don’t have to hit them hard in order for them to leave their mark. They also don’t make any noise, so you can use them with confidence in a quiet environment where you might be judged by your noisy actions, such as a library. 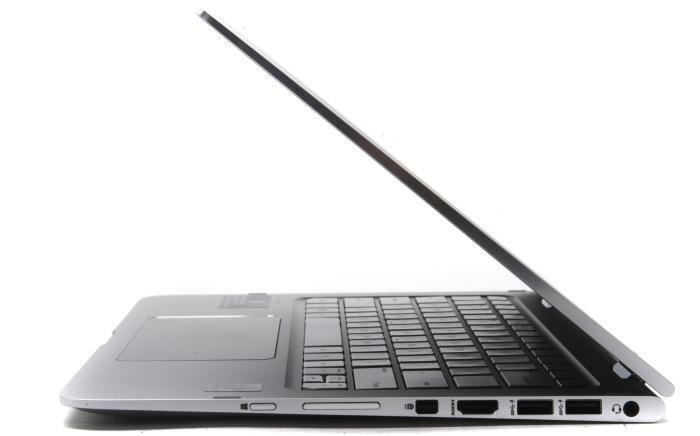 A backlight allows for typing at night, but the pale colour combination of the keys and backlight means that if the backlight is on when the laptop is in a brightly lit room, the key markings lack contrast and are hard to see. A row of function keys across the top are primarily ‘action’ keys, meaning that you can press them to perform actions such as volume level and brightness level changes; you’ll have to press the Fn key if you actually want an F key’s function. We like the little LED that’s always on to indicate which action key needs to be pressed in order to activate the keyboard’s backlight. When used as a tablet, there are dedicated volume and Windows Home buttons along the edge that can be pressed. The power button is also located on the side (again, owing to the possible tablet form factor). It sits almost flush with the edge and can’t easily be pressed by accident. There is an SD card reader on the side that can consume SD cards whole (on some other laptops they tend to sit halfway out), and you also get good stuff such as three USB 3.0 ports, Mini DisplayPort, and a full-sized HDMI port. Right side: headset port, USB 3.0, HDMI, Mini DisplayPort, volume buttons, Windows Home button. Left side: power port, air vent, USB 3.0, power button, SD card slot. On this angle you can also see the raised lettering on the lid. A crevice at the front of the laptop allows for the lid to be lifted quite easily, but because the hinges need to be strong for this type of convertible device, you can’t just lift the lid with one hand. You need one hand to hold down the base. We appreciate the functionality that the hinges provide, and we like the quality of the screen as well as the overall configuration. Also in the plus column is the useful array of features along the edges. The only thing we are concerned about is the touchpad, which we feel is wider than necessary; that, and the fact that it doesn’t get disabled when the device is switched to tablet form. Hopefully HP can at least rectify the latter issue with a software update.